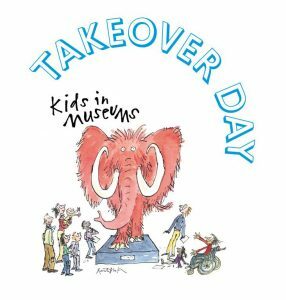 The LCC Investigate Learning team has collaborated to take part in national engagement events this Autumn, such as The Big Draw and Kids in Museums Takeover Day. Both events feature in the national campaigns of these organisations. The Big Draw describes itself as the ‘world’s biggest celebration of drawing’ and promotes drawing, inclusivity and well-being. In October a series of Big Draw:PLAY events brought increased numbers of visitors to the Usher Gallery (including a large increase in those under age 16 for October half term since last year). Creative art workshops encouraged participants to develop their artistic skills and respond to the stimulus provided by the landscape exhibitions. Fun activities such as ‘Funky Life Drawing’ and ‘Doodle Disco’ brought a lively feel to the events and feedback from visitors was extremely positive. Artwork from the events will be on display in the Clore learning room and an upstairs gallery until January. This has built upon the work started earlier in the year for The Collection & Usher Gallery Arts Council Artsmark Partnership collaboration. The Takeover Day at Lincoln Castle in November 2017 saw children taking over the adult jobs and learning the skills required for working at a heritage site. This experiential learning opportunity showed just what kids can do when faced with new challenges and author Damian Dibben, a patron of Kids in Museums, also came to join in the fun. Building on the success of the event last year, there will be a Takeover Day at three sites on 23rd November 2018. Jobs at Lincoln Castle, The Collection Museum and also Lincoln Cathedral will be taken over by pupils from Sir Francis Hill Community Primary School. Pupils will take on a variety of roles, for example costumed Victorian prison guides, media crew, exhibition and heritage skills designers, curators, visitor experience officers and many more. The collaboration between the LCC Investigate and Cathedral learning teams is exciting and will broaden the experiences for the pupils involved in the Takeover Day as they swap sites.